Air Bahia was a short-lived local airline that was formed by Gordon J. Myers a former Pan American pilot on July 13, 1979. The new commuter airline proposed to connect Southern California with various tourist and fishing spots in Baja California. 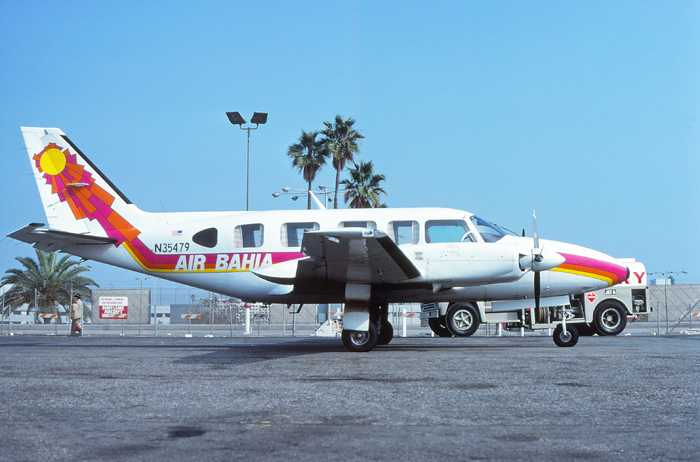 After acquiring a fleet of two Piper Navajo Chieftain and one Britten-Norman Islander aircraft, scheduled services commenced on August 25, 1979 with flights between San Diego and Tijuana, Mexico. The new airline quickly expanded adding cities in both the United States and Mexico. By early 1980, service had expanded to Long Beach, Las Vegas and Palm Springs with international services extending south to Ensenada, San Felipe, and Guyamas, Mexico. Additional Piper Navajo equipment was purchased bringing the fleet total to five, and allowing the aircraft to introduce flights to Los Angeles International Airport (LAX). A new "Executive Service" was promoted to proved high frequency flights between Los Angeles and San Diego. During 1980, the airline had considered purchasing the proposed Ahrens AR-404 Turboprop as well as Britten-Norman Tri-islander aircraft for delivery in 1981, however financial losses and declining loads spelled trouble for the small airline in the fall of 1980. The San Diego-Tijuana flight was anticipated to connect San Diego passengers to a proposed Tijuana-Luxembourg service that never materialized. 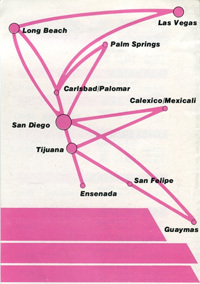 Low passenger loads and increased completion especially on the San Diego-Los Angeles segment forced Air Bahia to file bankruptcy and flights were halted on December 14, 1980. Plans to reorganize and continue flying failed, and the airline was ultimately dissolved in 1981. 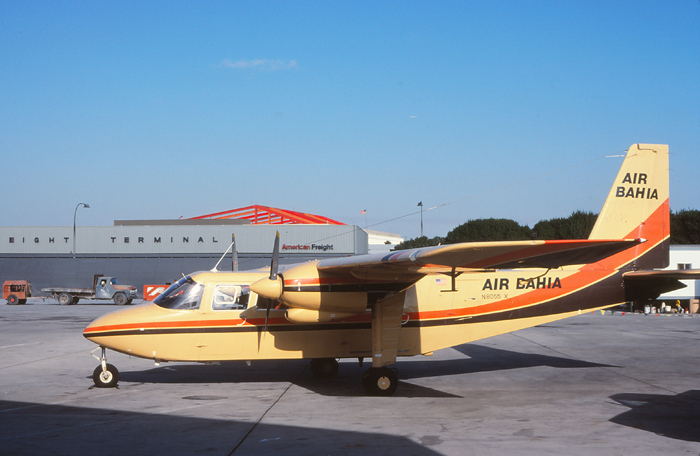 One of Air Bahia's Islanders parked at International Customers arrivals at Terminal 1 at San Diego Airport after an arrival from Tijuana in August 1980 is, N8055X, a Britten-Norman BN-2A-27 Islander. Parked at the original Commuter Airline Terminal ramp located on the west side of Los Angeles International Airport in November 1980 and wearing the airlines catchy livery is N35479, a Piper PA-31-350 Chieftain.